The best camping in South Dakota. Get Exploring! South Dakota is home to a variety of striking landscapes, remote open spaces, and plenty of history. 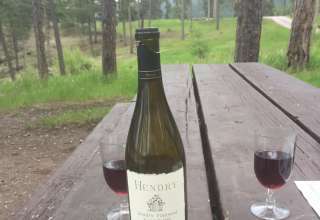 If you’re looking to connect with nature’s wild beauty at its truest, camping in South Dakota is a must. One of the nation’s most spectacular National Parks is right here, and you should definitely make a point of visiting. 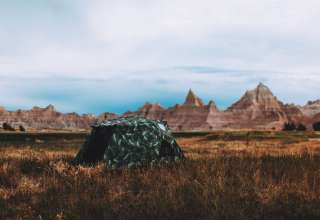 Known for its striking sedimentary rock landscape defined by pinnacles, buttes, and spires, camping at Badlands National Park is like being transported to another world. 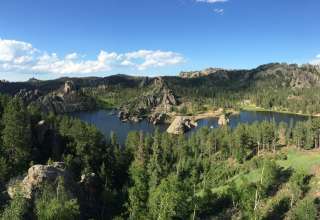 For a far different experience, visit the verdant landscape of Black Hills National Forest, popular for its broad diversity of wildlife spread among 1.2 million acres of hills, mountains, grassland, lakes, and ponderosa pine forest. 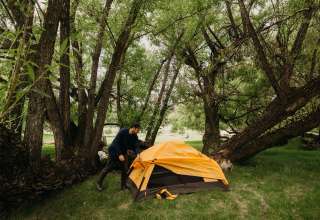 Within 20 minutes of Sioux Falls you can camp on the banks of the Big Sioux river at Big Sioux Recreation Area for a leisurely getaway of hiking, fishing, and snowmobiling. Visit Lake Francis Case for boating, fishing, and the opportunity to spot a few bald eagles. In most parts of South Dakota you can immerse yourself in the art, culture and history of the Lakota, Dakota, and Nakota tribes, who were the state’s earliest inhabitants. And for an added dose of history, visit the ever-iconic Mount Rushmore! Wind Cave National Park contains the world’s largest concentration of boxwork formations, which are notable for their honeycomb structure. About 72,000 Native Americans currently live in South Dakota, which is home to nine tribal governments. Many fascinating fossils have been found at Badlands National Park, including three-toed horses, saber-toothed cats, and ancient camels. South Dakota’s Black Hills are the nation’s tallest mountains east of the Rockies. Many scenes in Dances With Wolves were filmed at South Dakota parks, including Badlands, Spearfish Canyon, and the Black Hills.